Pansies (Viola x wittrockiana) are perennial in U.S. Department of Agriculture plant hardiness zones 7 through 10, but are typically grown as winter annuals in warm climates and spring annuals in cooler areas. Ranging from 4 to 10 inches in height and bearing blooms in shades of purple, blue, yellow, red, pink and orange, these colorful, easy-to-grow plants have few pest or disease problems. 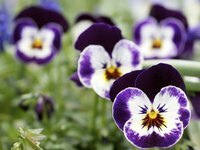 However, powdery mildew occasionally appears on pansy leaves because of certain environmental conditions. Fortunately, PM infections can be controlled using various homemade or nontoxic commercial solutions. Caused by a fungus (Podosphaera violae) that thrives in shady, crowded conditions, powdery mildew appears as a white, talcum powder-like growth on the tops and undersides of pansy leaves. The infection starts out as small white patches that grow to cover the entire surface. Infected leaves sometimes turn yellow, twist, curl or die, especially if the fungi attack as the foliage develops. Although the disease doesn't usually kill entire plants, severe powdery mildew infections can reduce vigor and make pansies decline faster. Powdery mildew disease thrives in spring and autumn when warm days are followed by cool evenings. Unlike other fungal pathogens, the PM spores don't require standing water to germinate and infect. In fact, water can kill PM spores. A homemade spray containing cow's milk and water can slow the spread of powdery mildew disease. Milk contains amino acids and salts, which act as natural germicides that can wipe out PM fungi. Make a solution containing 1 part milk mixed with 9 parts water. You can use any type of cow's milk, but low-fat varieties are less likely to cause a sour milk odor. Use a small spray bottle to apply the solution over pansy foliage, including the tops and undersides of leaves as well as the stems. Spray once a week and reapply after rainfall for optimal results. A homemade fungicide containing baking soda and horticultural oil can make your pansy plants inhospitable to powdery mildew fungi. Combine 2 1/2 tablespoons of lightweight horticultural oil with 1 gallon of water. Add 4 teaspoons of baking soda to the solution. Baking soda solutions can injure sensitive plant foliage, so spray a small, unnoticeable section of leaves and wait at least 24 hours to check for damage. If no burning occurs, spray all of the plant foliage. Use a handheld spray bottle to coat all foliage surfaces. Start spraying as soon as powdery mildew shows up, and continue spraying at 10- to 14-day intervals until the infection disappears. Biological fungicides containing the bacterium Bacillus subtilis can help prevent powdery mildew disease and sometimes kill existing infections. The bacteria feed on the fungi but don't harm any beneficial insects, plants, people or animals. One product recommends using 1/4 to 1/2 cup of Bacillus subtilis-based concentrate for every 1 gallon of water. Use a small sprayer to cover the tops and bottoms of all foliage to the point of runoff. Spray pansies once a week for the best mildew control. Oil sprays, such as those containing neem oil, work well to eradicate powdery mildew infections while also offering some protective properties. Look for ready-to-use neem oil products, or mix 2 tablespoons of neem oil concentrate with 1 gallon of water. Use a handheld sprayer to completely moisten all foliage. Spray pansies every seven days until the infection disappears, and then keep spraying every 14 days to stop powdery mildew from reoccurring. Neem oil can be toxic to honeybees if you make direct contact. Spray pansies in the early morning or evening when the pollinators aren't as active. Carefully read and follow the instructions on commercial fungicide labels, because directions will vary. Even nontoxic and homemade fungicidal solutions can cause eye or skin irritation on contact. Prevent accidental exposure by wearing safety glasses, waterproof gloves, long sleeves, long pants and a face mask when mixing or spraying any solution. Keep all pets and people away from treated plants until the solution thoroughly dries. Because shade and overcrowding promote powdery mildew disease, plant your pansies where they'll be in bright sunshine. Leave enough space around each plant to allow for good air circulation. Powdery mildew doesn't like wet conditions, so occasionally spraying your pansies with a strong stream of water from a garden hose can rinse the PM fungi off your plants. Spray plants by mid-morning, however, so damp leaves don't attract other, moisture-loving fungal pathogens. Clean up fallen leaves from around pansies to stop the fungi from overwintering in your landscape. Pick infected leaves off your plants and discard them in a covered trashcan. Don't compost infected plant tissue or you risk spreading powdery mildew disease to other pansies in your landscape.